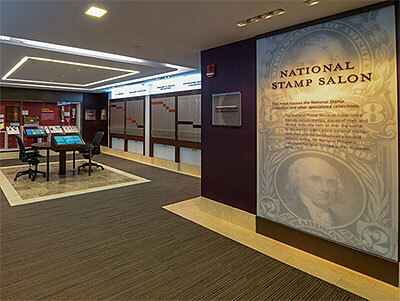 Pullout frames display tens of thousands of stamps and pieces of mail from the National Philatelic Collection, along with the Postmaster General’s Collection and the Benjamin K. Miller Collection. A large case displays medals, including the Medal of Honor awarded to stamp collector First Sgt. David McNerney in 1968; handstamps; dies; and other historic artifacts. A touchscreen interactive links to the museum’s online research database, Arago, which provides information about the stamps and mail.